Our Macbook / Pro / Air cases are simply amazing. Colorful Transparent Hard Cases For MacBook, Macbook Pro, Macbook Air, Unibody Macbook Case, Old Macbook. Our macbook case is here for you to protect your notebook from everything that can damage your apple notebook. You can now cover your laptop in a glossy, transparent see thru hard shell for a splash of color and strong protection against accidental damages. Our covers are set of two piece transparent protective hard shell that exclusively designed just for apple notebook. We give special attention for perfect form fit that accentuates the cool shape of the laptop. Therefore, our cover does not add lots of bulk neither change original shape of the model. Our custom design fit of cover lets your apple model open all the way which means it allows full movement of screen. We cut-out all ports,connections and CD/DVD drive on our covers that gives you full access to all features with shell on. One of best thing on cover is easy installation and removal. You can always install and remove the cover whenever you want. 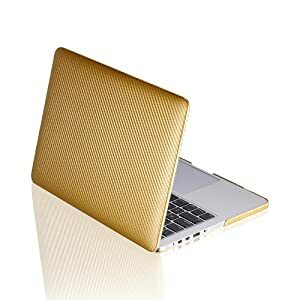 Our item is designed to offer full body protection to your laptop while letting the beauty and desing of the Apple model. We all know how much a Apple laptop can cost and getting it damages or dirty is not worth the risk. Our covers will definitely help secure your worries from getting damages on your computer. Covers come in sets of two transparent hard shells that have the perfect form fit to accentuate the sleek look of your notebook. Also,our covers allows for the full movement of the screen back and forth without removing the cover. Sleeves are made with durable,water-resistant neoprene material to provide complete protection to your laptop from unwanted damage and dirt. Unlike other sleeves, our sleeve is designed with slip entry closure with horizontal access. Compared to other sleeves that use zippers, clips, latches, or straps, our horizontal access sleeve you to easily slip in or take out your laptop without the hassle of additional steps. Sleeve is light-weight,slim,and comes in a variety of bright colors. It's easy to wash by hand with cool water and soap, which won't damage the sleeve. The slim design of the sleeve makes it easy to carry inside your bag,purse,or briefcase. Apple Inc., formerly Apple Computer, Inc., is an American multinational corporation headquartered in Cupertino, California that designs, develops, and sells consumer electronics, computer software and personal computers. Its best-known hardware products are the Mac line of computers, the iPod music player, the iPhone smartphone, and the iPad tablet computer. Its consumer software includes the OS X and iOS operating systems, the iTunes media browser, the Safari web browser, and the iLife and iWork creativity and production suites. The company was founded on April 1, 1976, and incorporated as Apple Computer, Inc. on January 3, 1977. The word "Computer" was removed from its name on January 9, 2007, reflecting its shifted focus towards consumer electronics after the introduction of the iPhone. As of May 2013, Apple maintains 408 retail stores in fourteen countries as well as the online Apple Store and iTunes Store, the latter of which is the world's largest music retailer. Apple is the largest publicly traded corporation in the world by market capitalization, with an estimated value of US$415 billion as of March 2013. As of Sept 29 2012, the company had 72,800 permanent full-time employees and 3,300 temporary full-time employees worldwide. Its worldwide annual revenue in 2012 totalled $156 billion. In May 2013, Apple entered the top ten of the Fortune 500 list of companies for the first time, rising 11 places above its 2012 ranking to take the sixth position. Apple's first logo, designed by Ron Wayne, depicts Sir Isaac Newton sitting under an apple tree. It was almost immediately replaced by Rob Janoff's "rainbow Apple", the now-familiar rainbow-colored silhouette of an apple with a bite taken out of it. Janoff presented Jobs with several different monochromatic themes for the "bitten" logo, and Jobs immediately took a liking to it. While Jobs liked the logo, he insisted it be in color to humanize the company. The logo was designed with a bite so that it would not be confused with a cherry. The colored stripes were conceived to make the logo more accessible, and to represent the fact the Apple II could generate graphics in color. This logo is often erroneously referred to as a tribute to Alan Turing, with the bite mark a reference to his method of suicide. Both Janoff and Apple deny any homage to Turing in the design of the logo. In 1998, with the roll-out of the new iMac, Apple discontinued the rainbow theme and began to use monochromatic themes, nearly identical in shape to its previous rainbow incarnation, on various products, packaging and advertising. An Aqua-themed version of the monochrome logo was used from 2001?2003, and a Glass-themed version has been used since 2003. Steve Jobs and Steve Wozniak were Beatles fans, but Apple Inc. had trademark issues with Apple Corps Ltd., a multimedia company started by The Beatles in 1967, involving their name and logo. This resulted in a series of lawsuits and tension between the two companies. These issues ended with settling of their most recent lawsuit in 2007. This article is licensed under the GNU Free Documentation License. It uses material from the Wikipedia article "Apple,inc". Sleeve comes with a durable neoprene exterior and a perforated trim, and offers great protection against the environment whenever you're not using your notebook. All of our sleeves are designed by Igluit,an independent company that specializes in protective covers for the apple notebook. Cover is a patented product of an independent company separate from Apple Inc. We use non-recycled transparent plastic to give strong protection against accidental damage with a splash of bright color and a massive dose of shine. For your convenience,we have designed our covers to be easy to use,with a snap-on installation for simply use and removal. The plastic cases from our store are cost-effective,durable,and precisely made just for the apple notebook. In addition,each plastic case is custom designed to be sleek and stylish. We also offer a variety of colors that you can choose from,based on your favorite color,school or company logos,or as a gift. Cases and covers are available for you to protect your laptop from anything that can cause damage. You can not cover your notebook in a glossy,transparent hard shell for a splash of color and strong protection against scratches and dents. Our cases come in sets of two halves of transparent plastic that are exclusively designed for the apple laptop. We have given special attention to the design for the perfect form fit that accentuates the sleek shape of your Apple notbook. Our case was made so that it does not add a lot of bulk or change the original shape of the original. Custom designed cases,covers lets your laptop open all the way,past 90 degrees,which is more than most other cases will allow. We have also cut out all ports,connections,and CD/DVD drives on our covers,which gives you full access to all your computer's features with the cover installed. Our case is designed to offer full-body protection to your laptop while maintaining the beauty of the original design. Your Apple notebook is a valuable asset to you, and we know that you want to keep it safe from scratches and dents. Our cases will help ease your worries about damages and dirt, while allowing you to enjoy the original sleek design of your computer. Unlike other covers from different case suppliers, our case has a perfect form fit that accentuates the original shape of your computer. Our cases also DO NOT have any logos or symbols. You can now protect your most valuable asset with our new strong, classy leather case. The case is made from high quality leather to bring you tough protection against accidental damage while giving your laptop a classy, stylish look. The case is a one piece leather cover that is specifically designed to slip on to your apple laptop. Its simple design lets you install or remove the cover easily and quickly. The covers also allows you to open and close your computer completely. The leather cover also allows full access to all ports and connections on the notebook, which means you can use your notebook to its full extent without the hassle of having to remove the case. The shell comes with a smooth, soft interior that keeps your notebook safely covered without causing any damage, while the outside offers a tough leather shell to keep scratches and dents at bay. The shell also does not cover any part of the keyboard, screen, or touch pad, and it keeps all unused parts of your laptop safe from damage. When not in use, simply close your computer with the leather case installed and hook the leather tab on to the top. The shell will maintain the original sleek and smooth design of the apple notebook while letting you express your classy sense of style. Clean your notebook and case to remove any particles that maybe clinging to the surface before putting on case. Remove all dirt/debris or sand from the outside surface. Keep your laptop closed to install the case. Install the bottom of the case first. Place notebook in bottom half of the case, snap on back hooks. Then push down computer slowly to the case until you hear click sound which means the case is installed securely. Place top half of the case on top of notebook, snap on back side of case first. Slowly push down the case to laptop until you hear click sound meaning the top part of case is securely installed. First, you need to uninstall the bottom part. Place the case upside down. Second, Lift up the back corners gently and there will be gaps between the shell and laptop after you lifted up the back corners. Third, lift up the front part gently and slide it from front back and the bottom case will be opened. It's time to uninstall top case. It's similar from the bottom case. During this instruction, there might be a time that it won't uninstall easily. Please do not use force to uninstall the case.